Delhi-based Pavitra Retail Pvt Ltd, which runs an e-commerce marketplace for organic products JoybyNature, has secured $1 million (Rs 6.4 crore) in a pre-Series A round of funding from Mumbai Angels, Contrarian Vriddhi Fund and a bunch of high-net-worth individuals (HNI), as per a press statement. Abhimanyu Munjal of Hero Group and Vaaman Sehgal of Samvardhana Motherson Group were among the other HNIs who backed the venture. The company will use the proceeds to ramp up technology and marketing, induct talent at the senior level and launch a private label. "JoybyNature has shown tremendous traction in a short period of time. Not only does it offer an array of 10,000 products from trusted brands, but it also has experts that give advice through live chats and aims to educate people about health-related issues," angel investors Samir Shah, Taha Nabee and Ajit Surana, who led the investment by Mumbai Angels, said in a joint statement. Joybynature was founded by Shailesh Mehta and Rahul Kumar. Mehta is an INSEAD management graduate and an IIT-Bombay alumnus, while Kumar is an IIM-Ahmedabad and IIT-Delhi alumnus. Founded in early 2014, Joybynature.com claims to address a critical gap of discovery and awareness about safe, organic and natural products in India. The organic and natural products market in India is potentially a $10 billion industry, the company claims. 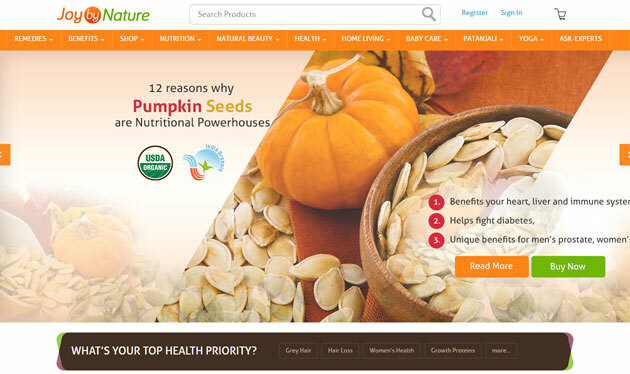 Joybynature.com says it had registered gross merchandise value (GMV) of Rs 1.7 crore in 2014-15. It currently works with over 300 vendors across the country and gets over 65 per cent of its orders from states outside North India, the statement said. Somak Ghosh, managing partner, Contrarian Vriddhi Fund, said a shift in consumers' mindset towards organic and natural products coupled with their increasing willingness to transact online encouraged it to invest in the company. Equity Crest was the financial advisor to JoybyNature.com for this fund-raising round. There are a bunch of other firms in the organic products e-commerce domain and some have also raised funding in the past: Organicshop.in raised Rs 30 lakh from Rajasthan Angel Investor Network (RAIN) two years ago; Freemont Partners Pvt Ltd invested in Natural Mantra. There are other peers such as Times Internet's Satvikshop.com. Contrarian Vriddhi Fund Joybynature.com Mumbai Angels Pavitra Retail Pvt. Ltd.